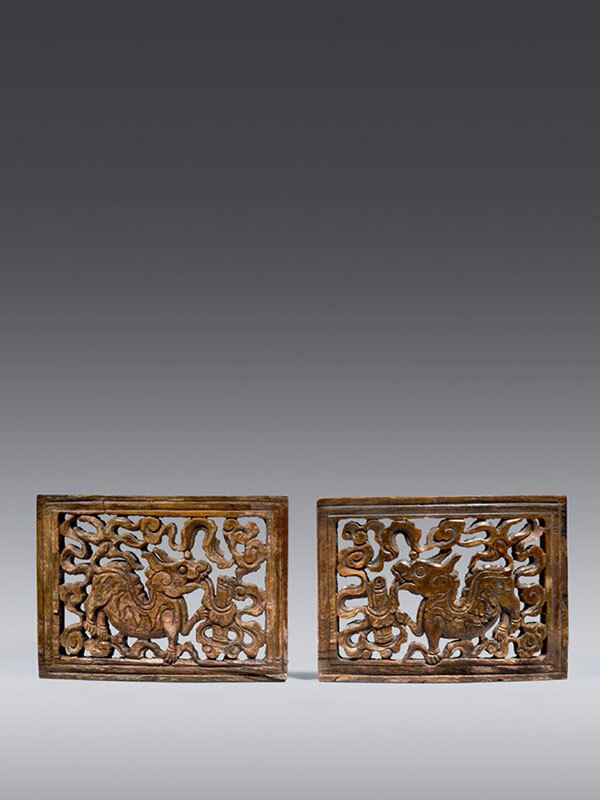 A pair of openwork horn plaques of curved rectangular form, each carved with a horned mythical animal, qilin, walking through cloud scrolls, each holding in its mouth a beribboned scroll. The top and bottom rims of the plaques have a row of holes drilled into them. The present plaques are carved in a very unusual material, namely horn. Most comparable plaques are carved either in jade or in ivory. A particularly similar plaque in ivory from the Kwan Collection, dated to the Jiajing or Wanli period (1522 – 1620) features a baize, a mythical animal that can speak in human language. A Ming dynasty jade plaque carved with a qilin, probably made to be inserted in a belt, is in the collection of the Palace Museum, Beijing.